If you recall, the first week we learned about the three chords you absolutely, positively CAN'T do without. If you need to review that, click here. Then the next week we took an airplane ride over Chordland just to get the lay of the land -- the overview of the world of chords. If you need to review that ride, please click here before going on. Last week you learned how to easily turn major chords into minor chords just by moving one key one-half step -- by lowering the 3rd of the major chord. If you need a review of minor chords, click here. 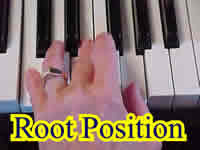 Today we are going to cover chords "upside down" -- chords that stand on their head. If I was strong enough to pick you up and stand you on your head, would you be a different person? Of course not. You would still be you. And yet many people get all confused when chords are turned upside down. They recognize them when they are in root position, but when you stand 'em on their head....well, it gets kind of fuzzy for folks. Now it's up to you. 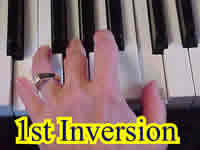 Play each major chord in root position, then 1st inversion, then 2nd inversion. Play each chord up and down the keyboard for at least 2 octaves -- maybe 3 octaves. Play them with your left hand, then play them with your right hand. Then play them hands together. Go through all 12 major chords, inverting every one. 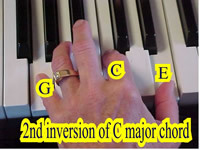 Then go through all the 12 minor chords, inverting each one up and down the keyboard -- hands alone, then hands together. Next week, will add 12 more chords to our growing list of chords we can play. We'll take up diminished triads, and you'll see how easy they are to learn once you know major and minor chords!